Infinitec, which stands for infinite potential through technology, is the technology program of UCP Seguin of Greater Chicago. The mission of Infinitec is to advance independence and promote inclusive opportunities for children and adults with disabilities through technology. We are a member-based organization currently supporting school districts in Illinois, Kansas, Minnesota, and Pennsylvania. Training and Education includes face-to-face and distance learning for professional development. Information Services consists of extensive web and hard copy resources. 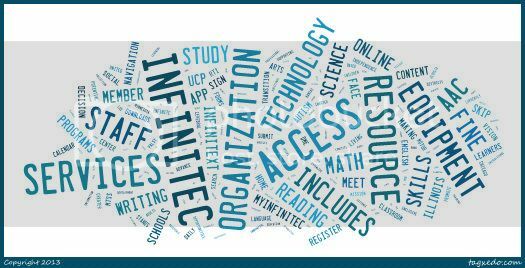 An additional innovative resource is InfiniTEXT, an online, accessible instructional materials collection which provides access to over 11,000 digital text files for qualified K-12 students with print disabilities. Access to Expertise includes access to highly experienced technical assistance staff. Equipment Services includes discount purchase programs and a lending library of equipment for the state of Illinois.